Grand Regional (Rapids) Voices is your chance to have a say in your community. The group normally meets on the first and third Saturday of each month at the Pickled Loon Restaurant on Hwy. 169 South, Grand Rapids, MN. Until the ISD 318 Bond Issue vote is held on April 9th, meetings will be held every Saturday. Meetings start at 9:00 A.M. This is always your place to have your voice heard. This meeting is open to the entire region. Click on the "Contribute Articles & Ideas" link to ask questions and offer opinions or concerns. Lynda Jo Thompson and Dan Chase describe their experiences on the Grand Rapids, Minnesota City Council Campaign Trail. Robert Ward, candidate for Mayor of Grand Rapids Minnesota, thanks his supporters and the public on the last day before the general election. In a recent statement made by Mayor Adams ( with consent of the council) Adams professed, “Your City property taxes have not risen in the last three years unless your property value also rose.” Was this a deliberate effort to spin the information in the flier? The statement on our political flier said, “In the last ten years, not three, your property taxes have doubled” ( see flier copy below) . Again, Mayor Adams you are clearly out of touch with the issues effecting your …constituency. 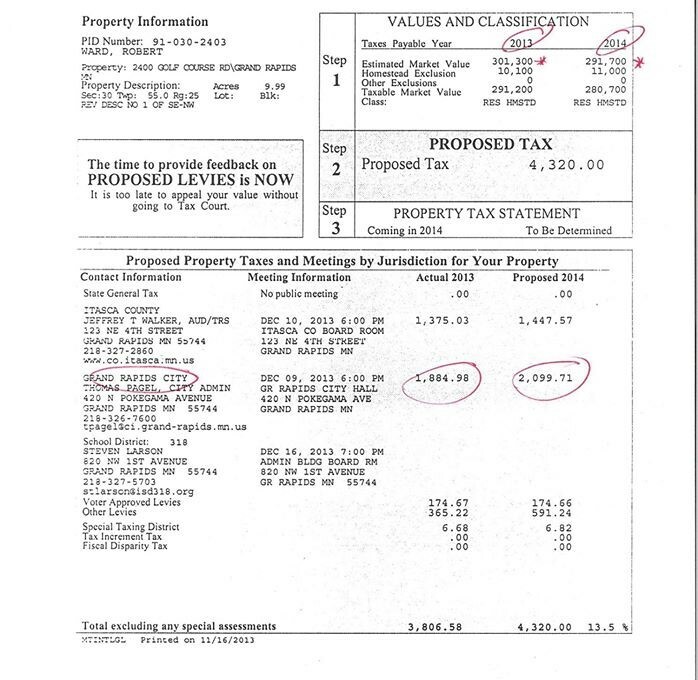 To add strength to our position, as promised in the Grand Rapids Herald 11/2/2016 opinion edition, I am posting both my tax statements from 2007 and 2016 on my own home. Clearly the City taxes have more than doubled as the property value went down. 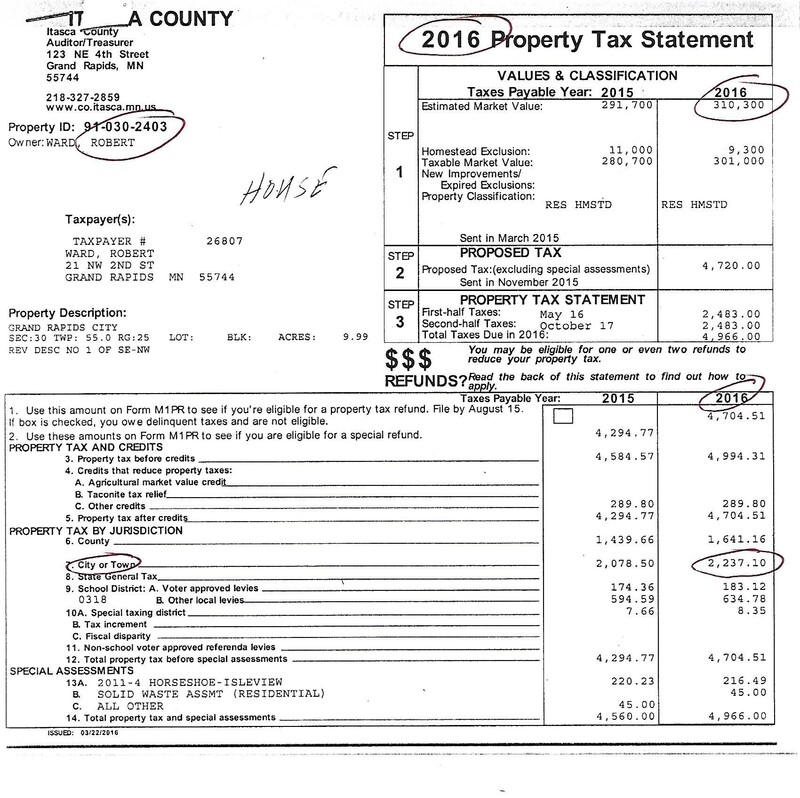 As promised 2016 Property Tax Statement. 2007 will be below it. 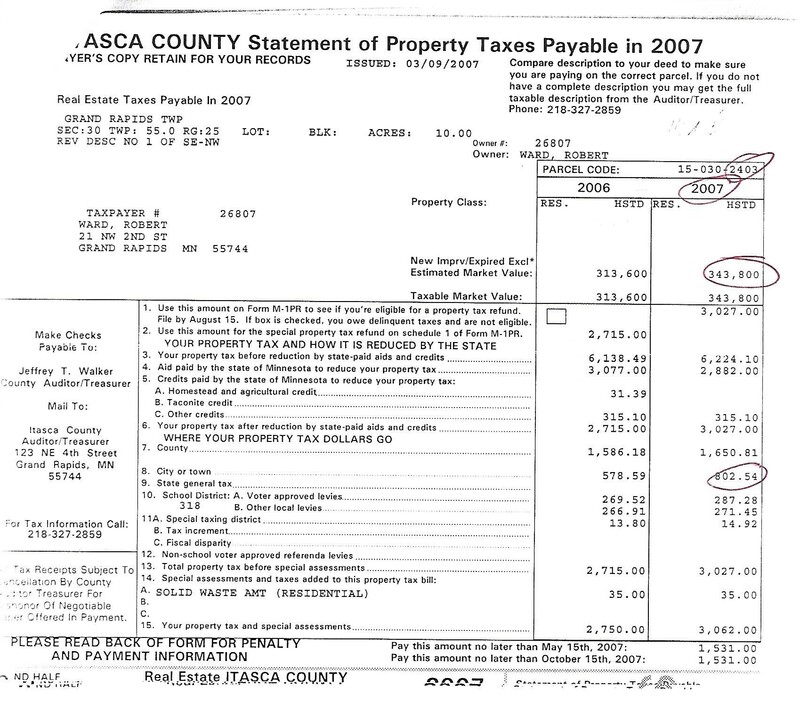 As promised 2007 Property tax statement. We also promised the 2013 & 2014 tax statements as a response to Adams statement of no increases in the last three years. All of this is of course is a sideshow to the fact that Grand Rapids is rated 3rd most expensive city government, of cities over 2500 people per capita, in the State of Minnesota as shown on the Minnesota State Auditor’s website latest comparison tools. It is time for New Leadership, New Voice, New Direction. Was the Grand Rapids City Council Candidate’s Forum on 10/14 Rigged? Craig Nelson and Joe Maurer discuss their observations of the Grand Rapids MN City Council Candidates Forum which was held on October 14, 2016 at the Grand Rapids City Hall. One of their main concerns was that the Forum format and line of questioning was slanted toward a specific political ideology and was designed to favor the incumbents. Watch the Candidates Forum for yourself at ICTV’s Facebook Page link which can be found on ICTV’s website: http://www.watchictv.org. Is This a Pay to Play Conflict of Interest? Rob Ward talks about the web based advertising by the League of Minnesota Cities that offers vendors access to city officials and city decision makers. The League of Minnesota Cities offers differing levels of sponsorships to vendors who wish to obtain municipal clients.